A brave boy named Climber sets off to Block Mountain to become a warrior. Equipped with jumping boots, armor and a head band, he must find a magical sword and defeat Dragalo. 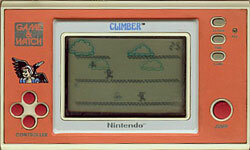 On the mountain, Climber must avoid thorny walls, Blockman and his pet bird Eyerom as he punches his way up the mountain. At the summit you can either grab Hentori the Bonus Bird, or face the dreaded dragon, Dragalo. For each floor you climb, you earn 1 Point. Use the moving platforms to ascend.